For Game of Thrones fans who like to keep a notebook handy at all times, these Light Up Notebooks are just the thing. They come packaged in a sturdy clear plastic box which can be used to keep your notebook in the same condition it arrived in. They come in three variants, representing the great houses of Westeros: Stark, Lannister and Targaryen. We were sent a Lannister notebook for review. 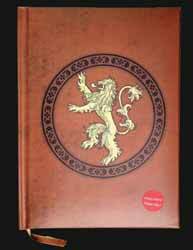 The design is quite impressive, with a cushioned faux leather looking cover which incorporates the Lannister logo. Press the bottom right hand corner of the cover and the logo lights up for approximately 20 seconds (slowly fading up, staying lit and then fading down). There's even a battery compartment on the inside, so you don't have to worry that the book's light has a limited shelf life. There are 100 pages for you to make notes in, with each having a small version of the logo at the head of the page. Each page is lines, with a fake aged effect to give it that ancient feel. 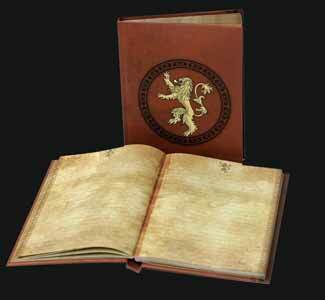 This is the perfect give to buy that Game of Thrones fan that is hard to buy for.